Photographer Alec Soth, recently featured in our Saturday Matinee series, wants to turn a used RV into an art school on wheels with The Winnebago Workshop, a Kickstarter project. The Winnebago Workshop. Showing slides on the side of the RV. The plan is for the rejuvenated RV to rumble around Minneapolis, Minn. pairing artists with teens to reshape how art is taught. Along with Soth, local artists, teachers, and other mentors will show teens how they can use art to engage with the people and places around them. 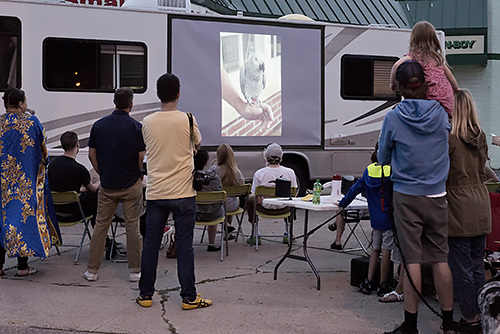 Wherever the RV stops, the group will create public pop-up events like slide shows of the students' work projected on the side of the RV. Learn more about the project here, and access images for the project here. Our first goal is to discover and recruit a crackerjack collection of teen artists. We will connect with local teachers, artists and community organizers to scout for a diverse selection of young visual storytellers of all disciplines. Our second goal is to create a mobile learning environment. By converting an old RV into an art school on wheels, we plan to make the world our classroom. Along with the LBM team, we'll regularly bring in (or pick up!) successful artists and mentors to work closely with the participants. Our final goal is to engage with the broader community. We want to show how students can give back to the community through storytelling. In each area we visit, we'll create public "pop-up" events such as slide shows of the students' work projected on the side of the RV. The project is about a third funded with a month to go. Rewards are more imaginative than the typical Kickstarter project including a honk of the horn (for a dollar), taking over your Instagram account for a day ($300) to personalizing the Winnegabo's vanity plante ($10,000).